Snapshot – The Toyota Fortuner is India’s best selling luxury SUV by a mile. Fortuner owners who shell out about 30 big ones to bring their rides home usually don’t hit the modification circuit. However, the sheer number of Fortuners sold in India and South East Asia means that some end up in the chop shop, with various degrees of modifications. Here are six modification ideas for India’s favourite luxury SUV. The Toyota Fortuner looks butch even when stock and is an imposing sight when it fills up the rear view mirror of a car ahead. Street proofing the Fortuner would involve tapered steel bumpers that give the front end plenty of character, and adding a front bull bar to keep pesky two wheelers and autorickshaws away. A couple of fog lamps mounted under the bull bar will also add to the “Don’t Mess With Me” looks of the SUV while giving it plenty of functionality on long highway drives. 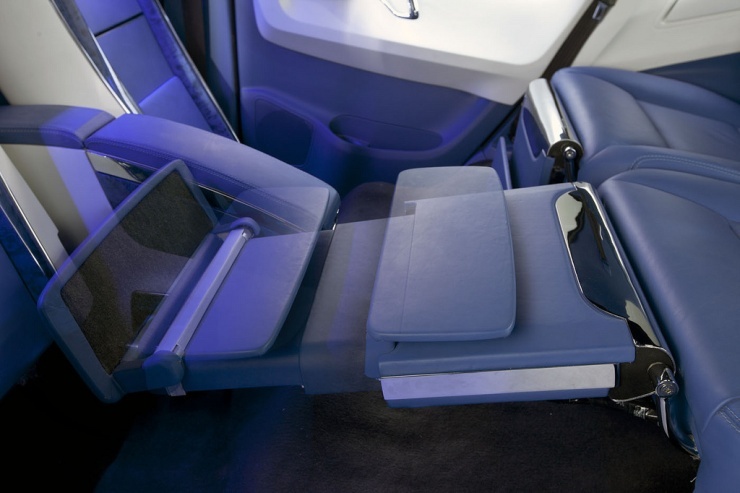 You must ensure that the bull bar added is from a reputed manufacturer who has tested the component for compliance in a vehicle equipped with airbags and crumple zones. 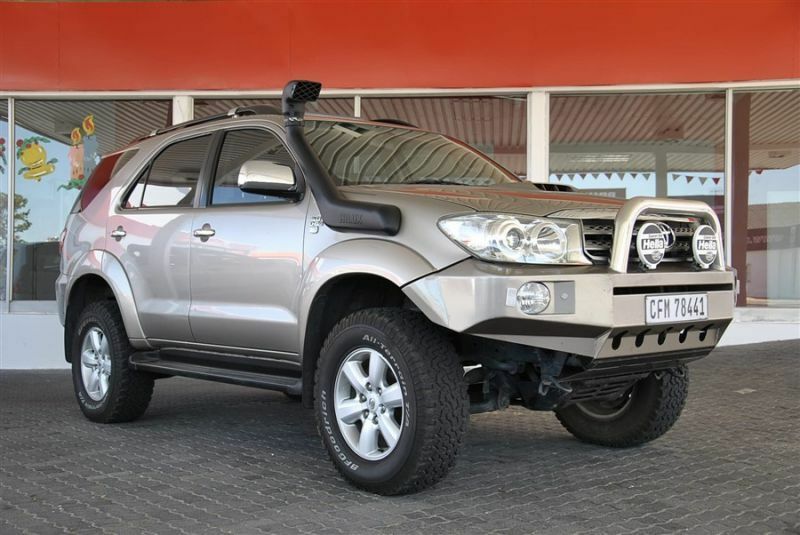 The Fortuner sits on a ladder frame and shares the rugged IMV platform with the legendary Hilux pick up truck. 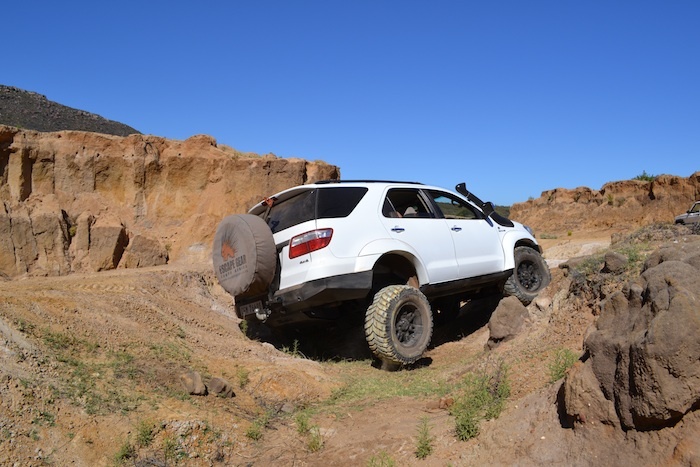 The Fortuner, in modified guise, can take a fair share of heavy off roading. For this though, better underbody protection by means of strategically positioned bash plates, and an ample departure angle are called for. While a tapered steel bumper takes care of the front end, the rear could do with a smaller steel bumper and a spare tyre holder on the hatch lid that gives the SUV a better departure angle. The next big step is a body lift and a suspension upgrade, which we’ll be dealing with next. A body lift for the Fortuner is another measure that improves ground clearance by quite a bit, and overall off road capability of this SUV. Ready made body lift kits are available an d the Fortuner’s body can be lifted by 2-3.5 inches. Doing so will increase the chances of the Fortuner rolling over. So, you need to take it easy when it comes to highway cornering. Upgraded suspension from a top drawer brand can make the Fortuner handle the body lift quite ably, while also giving the SUV a more pliant ride. As it is, the Fortuner is notorious for a bouncy ride, and a suspension upgrade can correct this. 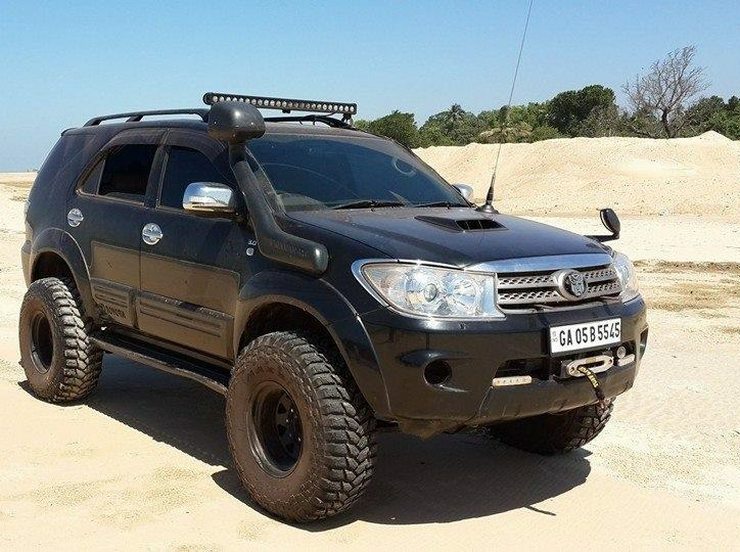 Also, a lifted Fortuner will look very brash and imposing. Mud terrain tyres give the off road oriented Fortuner good grip in off road conditions while improving the vehicle’s stance dramatically. However, these tyres are not to be used on tarmac as they aren’t very grippy in the wet. Also, mud terrain tyres wear out rapidly, making them best suited for off roading. So, having two sets of tyres, one for on road and the other for off road conditions is the strategy to take. The Fortuner offers ample pep for most conditions. However, those who want quicker getaways and better roll on times can opt for remaps/tuning boxes. Do note that adding a tuning box or remapping your Fortuner’s ECU can reduce engine life of the vehicle, and put more stress on the drive train. This is a venture you need to take after evaluating risks. 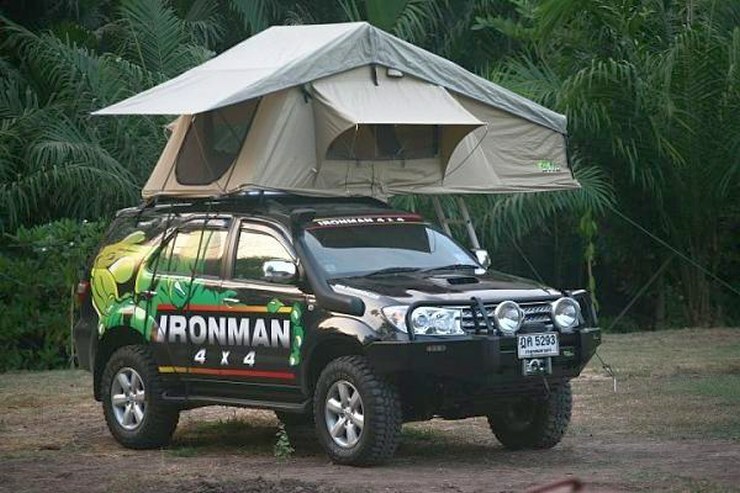 A snorkel however, is a very valuable addition thanks to the utility it offers. A cold air intake and a free flow air filter are two other changes that can boost performance of the Fortuner’s turbo diesel engine. 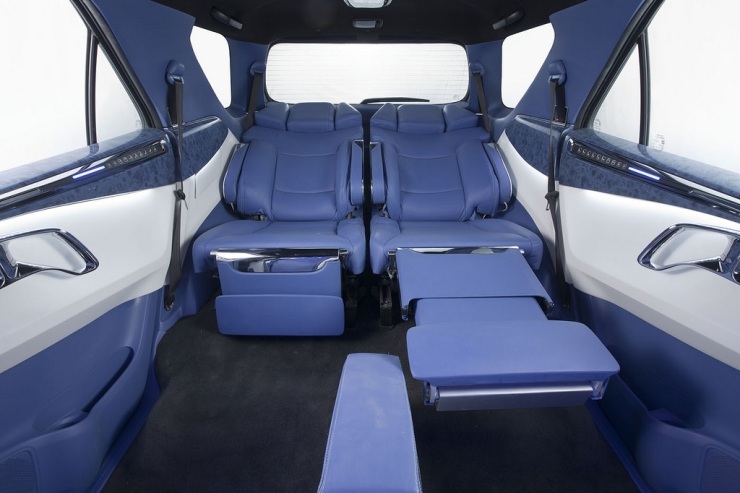 If you’re more concerned about comfort and enjoying the cabin of your Fortuner, going to DC Design and converting your SUV’s cabin into a lounge is a recommended route. While you’re at it, getting a high quality adjustable aftermarket suspension kit is also a measure that can sort out the Fortuner’s bouncy ride quality. After all, what’s the point in lounging around in a DC designed luxury cabin, only to be distressed by a bouncy ride?